WEST BEND -- After a very rainy week, local rivers continue to rise causing problems and prompting authorities to issue a warning: stay off the water. West Bend police helped rescue nearly ten people kayaking Sunday on the Milwaukee River. While some think it's a fun and wild ride several found out today how dangerous it can be. The pouring rain was the least of one group's concerns who kayaked down the flooded Milwaukee River in West Bend Sunday afternoon. 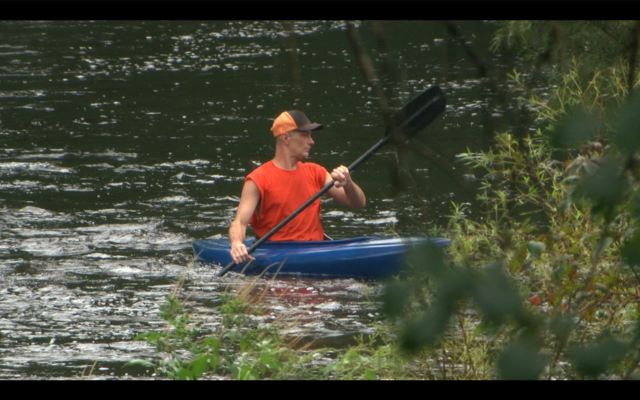 The current was so mighty a majority of them wound up in the water, including first time kayaker Jason Flasch. "For whatever reason it seemed like the current was coming from two different angles and it just turned me," he said. "My buddy lost it and I lost it two seconds after him. I'm thinking, well I can ride this out, but you start getting fatigued and I'm like, here goes the boat. So I'm just like, I'm just going to get on shore and save my life." Flasch was able to get himself to dry land after a battle against the current. "It's extreme, it's very extreme," he said. "We just received a 911 call that there were a group of 6 kayakers that were traveling down the river, 2 of them capsized and are still in water," said a West Bend police officer over dispatch. West bend police say two capsized kayakers, turned into five, then the whole group of 8. Nathan Last watched the rescue. "It's scary, I mean, I love kayaking also, but with the water as high as it is right now, it's a scary thing," Last said. Luckily, all eight capsized kayakers who police tended to Sunday made it to shore without getting hurt.